My name is Joe Lapp, but kids call me Spider Joe. 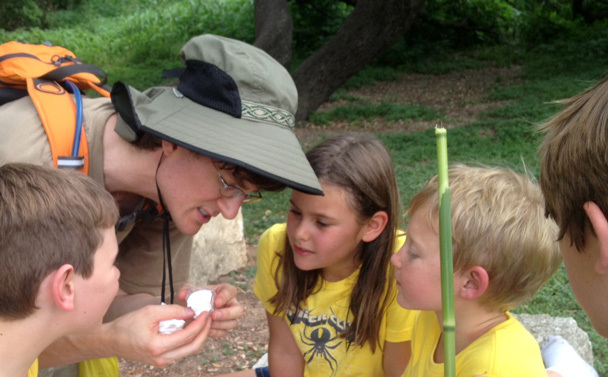 I'm an arachno-naturalist and nature educator in Austin, Texas. I study spiders, teach people about spiders, and develop software to support taxonomic research. Tarantulas are already popular, so I teach about the everyday spiders we see, like jumping spiders, crab spiders, and orbweavers. I've recently scaled back my educational programs and now focus more on taxonomic research and on grand schemes for reaching more people through the Internet. My children's programs are outdoors. We take short walks to discover how spiders are amazingly diverse and everywhere. I catch and release spiders so children can get a close look, and I handle spiders to demonstrate their personalities and web-spinning tricks. Over the course of my programs, fear of spiders transforms into healthy respect and fascination. Children also learn exactly when spiders bite and when they don't, empowering children to both enjoy spiders and deal with them safely their entire lives. My adult programs are mainly for educators. I give presentations and lead walks. We cover biology, spotting tricks, methods for rapid collection, and identification. I can fill as much time as I'm given, depending on the enthusiasm of the participants. I share ways of talking about spiders that make sense to children and activities that educators can do with children. I'm also happy to train people in spider handling, for those who would like to do demonstrations in their programs. I hope to spark a passion for spiders in educators that is contagious with their students. I've conducted programs for many parks, preserves, and schools throughout the Austin area, including the following: Austin Butterfly Forum, Austin Nature and Science Center, Austin Tinkering School, Balcones Canyonlands National Wildlife Refuge, Capital Area Master Naturalists, City of Austin (Wildland Conservation Division), El Ranchito, Emily Ann Theatre & Gardens, Hays County Texas Master Naturalists, Ladybird Johnson Wildflower Center, McKinney Falls State Park, McKinney Roughs Nature Park, Travis Audubon Society (Youth Camp), University of Texas at Austin Biodiversity Collections, Westcave Preserve, Wild Basin Wilderness Preserve, and various summer camps, after-school programs, and homeschool groups. At present I'm only holding a limited number of programs and only charging for expenses. I enjoy children and teaching and want to keep both in my life as I pursue the next step in the evolution of my spidering. Feel free to contact me at arachnojoe@gmail.com. Due to an injury that I manage, I'm unable to travel more than 40 minutes or so from southwest Austin.